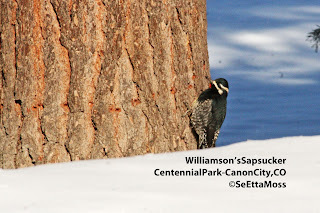 I found this male Williamson's Sapsucker at Centennial Park today and like the other sapsucker it was working near the base of the tree--the place on a pine tree where the sun shines the most and where the tree is least frozen. Also they both worked on the south exposures of the trees, again very adaptive. The sap holes visible on this tree are those this bird likely drilled today, one even shows the glint of sap albeit likely quite frozen. Today I went out in late morning to see if any of the wintering sapsuckers would be out after we hit -19 degrees F last night. 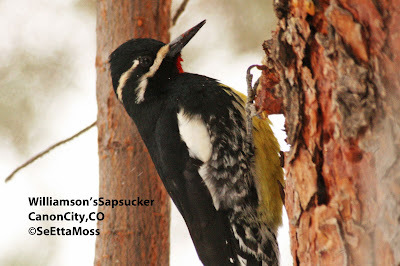 The temp was up to around 7 degrees F when I located this male Williamson's Sapsucker drilling repeatedly at the lower part of the trunk including the base of a large ponderosa pine in which I have previously seen a male Williamson's feeding this season. 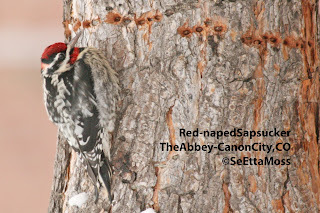 It is very unusual to see a sapsucker working at the base or lower part of trunk as they tend to feed above 4 feet or so in my experience (and as documented by the location of thousands of sap wells in Canon City trees). Yesterday was nice compared to today. After a low of minus 3 degrees in Canon City (worse in other front range cities), the high only rose to plus 5 degrees at midday. I went out to check on the wintering sapsuckers to see if they would be trying to drill holes in frozen trees and lap up sap that must be thick from well below freezing temps. 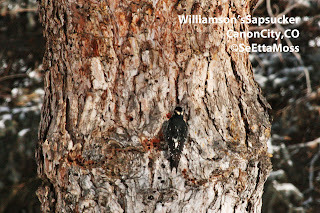 Since I have been home I have refound just over half of the Williamson's Sapsuckers, one female Yellow-bellied and the one male Red-naped, that have been wintering in the Canon City area this year. I had to take a break from posting for a bit after the intensive almost daily posting I did for a month. Now I'm getting back in the proverbial saddle. I took these pics a week ago when I drove up the Bighorn Sheep Canyon that runs west of Canon City. The Sangre de Christo Mountain Range begins just south of Salida and extend south/southeast through Colorado into New Mexico.